Marine bilge pump plays a vital role in the operation of vessels. The mariners clean or repair work inside the engine room. And some water or other liquids will run into the bilge wells. These bilge wells then should be emptied by means of a marine bilge pump. As the water may contain oil, it needs to be cleaned before pumping overboard. The bilge well is usually located in the hull of a vessel. And it collects excess water that fails to drain off the side of the deck. A marine bilge water pump is used to make sure that these bilge wells are emptied regularly. And it ensures that the vessel stability is not compromised. The bilge water may contain contaminants such as oils, chemicals, particles and other materials. These have been transferred from other parts of the vessel. And therefore the marine bilge water pump must be able to cope with a certain degree of particles. Marine bilge pump is used to been operated by either a float switch or manually. On board a ship or vessels, the bilge pump is used in case of both daily purpose and emergency. SILI PUMP can supply both types. They are specially designed for marine applications. And they will serve the owner as a reliable and trustworthy piece of equipment for a long time. For daily use, a small bilge pump will handle the task. These bilge pumps usually are self-priming. With a built-in self-priming device, there is no need of any additional priming device. Just make sure the pump casing is filled with water before pump start-up. However, when an emergency arise, it may be necessary to use an emergency bilge pump. Usually this marine bilge pump is a big vertical centrifugal marine pump. In such cases, one of the SW cooling pumps, ballast pump, fire pump or a general service pump can be used and thus serve a dual purpose. An ejector priming pump can be an optional device for such kind of marine pumps. 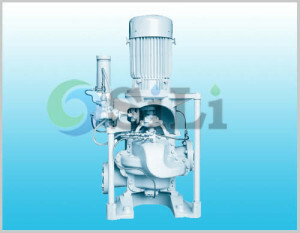 SILI PUMP is a reputation marine bilge pump supplier and manufacturer in China. Click the following suggested pump link to find a suitable model: marine bilge pump. Google+, click for marine bilge pump. Facebook, click for marine bilge water pump.